Colorado Springs, Colorado. 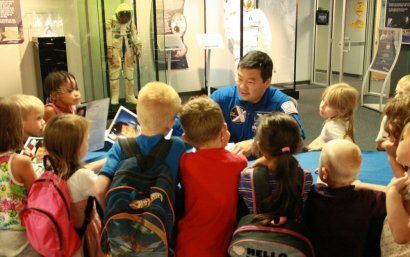 September 29, 2014 – The Space Foundation is hosting former NASA astronaut Leroy Chiao, Ph.D., at the Discovery Center on Thursday, October 9, to share his experiences as a Space Shuttle astronaut and resident of the International Space Station (ISS). Based in Houston, Chiao is the Space Foundation’s special advisor – human spaceflight. His Space Shuttle missions include: STS-92 Discovery, Oct. 11-24, 2000; STS-72 Endeavour, Jan. 11-20, 1996; STS-65 Columbia, July 8-23, 1994. Additionally, he flew as flight engineer 1 aboard Soyuz TMA-5 to the ISS, where he served as commander and NASA science officer for Expedition 10. He lived on the ISS for more than six months. During the afternoon, from 1:00 – 5:00 p.m., there will also be presentations and hands-on activities in the Discovery Center to demonstrate what astronauts experience while training for space missions. There will be a special premier showing from 3:30 – 4:30 p.m. of the Science On a Sphere® film A Pale Blue Dot, with a live Google Hangout with the film’s producer Victoria Weeks. There will also be a 6:00 p.m. showing of David J. Ruck’s documentary, I want to be an Astronaut, which examines the current state of America’s space program and a boy’s quest to become an astronaut. These October 9 activities are part of the Space Foundation’s World Space Week celebration and are included in the price of Discovery Center admission. Discovery Center daily admission fees are $10 for adults, $7.50 for seniors (age 65+), $7.50 for college students with I.D., $4.50 for children ages 4-17. Children age three years and younger are admitted free. Military fees are $5.00 for adults with I.D., and $4.00 for military children ages 4-17 with I.D. Military includes active duty, guard, reserve or retiree with I.D. For information, call the Space Foundation at 719.576.8000. ← Lockheed Martin Donates $500,000 To Girls Inc.